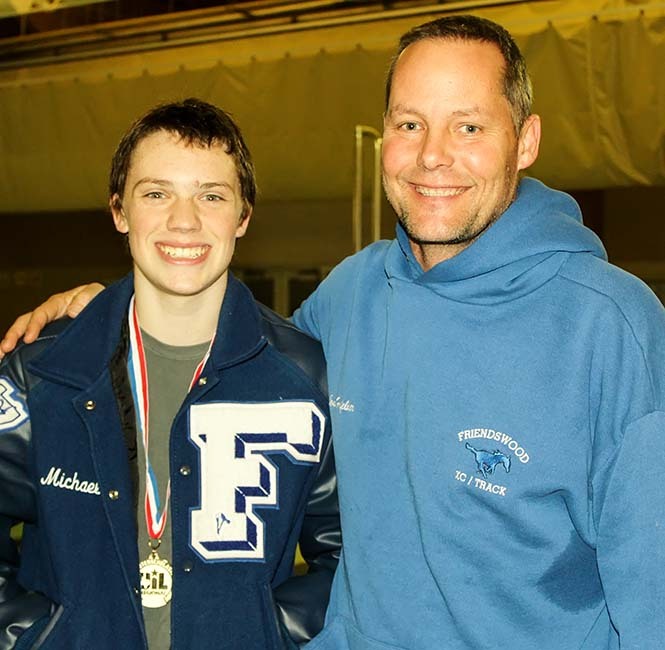 DIVER OF THE MEET - Sophomore Michael Claunch shares the moment with Friendswood coach Steve Haffelder after winning the 6A Region 6 1-meter diving sending him to the UIL state swim meet in Austin on Feb. 20-21. FRIENDSWOOD — The Friendswood Mustangs scored 253.5 points to finish third at the 6A Region 6 swim meet behind Clear Falls (319.5) and FB Clements (297). Their point total enabled Friendswood High School to capture the overall team title as the Friendswood girls won the Region 6 with 278 points. The combined point total of 531.5 finished ahead of Clear Falls (502.5) for first place. The Friendswood quartet of junior James Tomerlin, senior Matt Garry, junior Daniel Theall, and sophomore Mark Theall qualified for the UIL state swim meet in Austin on Feb. 20-21 in the 200-yard Medley Relay with a winning time of 1:36.82. Sophomore Michael Claunch also qualified after he won the 1-meter diving with 380.75 points to edge second place Christopher Norlin who posted 364.30 points. Claunch was named the Diver of the Meet. He received the same honor at the District 24-6A meet. Other area teams that competed was Dawson who placed sixth with 160 points. Manvel placed ninth with 79 points and Pearland scored 53 points for 13th place. No other boys qualified for state.